An English theologian and a member of the Franciscan order; born in the county of Gloucester; died in Paris, 1245. He was educated at the latter place, where he afterward became a teacher. Alexander may be considered as the originator of the reformation of Christian scholasticism of the thirteenth century. In his "Summa Universæ Theologiæ" he for the first time made extensive use in the systematic treatment of Christian theology of Aristotle's "Logic" and such other works of this philosopher as were accessible in Latin translations. The dialectic method, which was afterward employed in the works of Christian scholastics, was probably developed and improved by him, whence he acquired among his contemporaries the title of "Doctor irrefragabilis et theologorum monarchus." Although steadfast in his theological convictions, he was not in the least intolerant toward other denominations; indeed, toward the Jews he exhibited exceptional clemency and impartiality. As to the question whether Jews and pagans with their religious practises should be tolerated among Christians, he deprecates the classing of Jews with pagans or Saracens who "usurp the Holy Land," and maintains that the Jews should be treated with forbearance for the reason that through them the Christians received the Law; Jesus of Nazareth was descended from their race, and their preservation is enjoined by Holy Writ. In answer to an argument against the toleration of the Jews—namely, that the Talmud in many places slanders Jesus and his mother—he maintained that the Jews committed no wrong in writing such statements, as it was their religious belief that the Messiah had not yet come. He justified the punishment of Jews when they were guilty of public defamation or blasphemy, claiming, however, that even then it should not be more severe than the punishment of Christians committing like offenses; but all books containing revilings he held should be burnt ("Summa Universæ Theologiæ," book ii. p. 179, § 1). This verdict reflects the state of mind prevailing at that time in Paris, occasioned by the discussions and proceedings then pending relative to the burning of the Talmud. Relying upon a decision of the Council of Toledo (589), and moved by other motives as well, Alexander was opposed to constraining the Jews by punishment and menaces to embrace the Christian faith (ibid. book ii. p. 179, § 4). Unlike other theologians of his time who eagerly sanctioned the confiscation or plundering of the property of the Jews, hecontended that though the estates of Saracens or heretics might properly be seized by the government, the property of Jews ought not to be confiscated at all, since if the Jews were permitted to live, they should not be deprived of the means of living (ibid. book iii. 36, § 3). In the "Summa Universæ Theologiæ"—the first fundamental work inaugurating the golden era of Christian scholasticism—are found traces of the two Jewish philosophers who exerted great influence upon the scholasticism of the thirteenth century—namely, Solomon ibn Gabirol (Avicebron) and Moses ben Maimon. Alexander affirms that not only corporeal but also spiritual substances—particularly the human soul—are composed of matter and form (ibid. book ii. ch. 12, § 1), a doctrine the logical consequences of which gave its original stamp to the system of Avencebrol (the name under which Gabirol is quoted by the scholastics), and which became from the time of John Duns Scotus (1274?-1308) the distinctive doctrine of the Franciscans as contrasted with that of the Dominicans. More numerous still are the instances of agreement with the "Moreh Nebukim" of Maimonides. 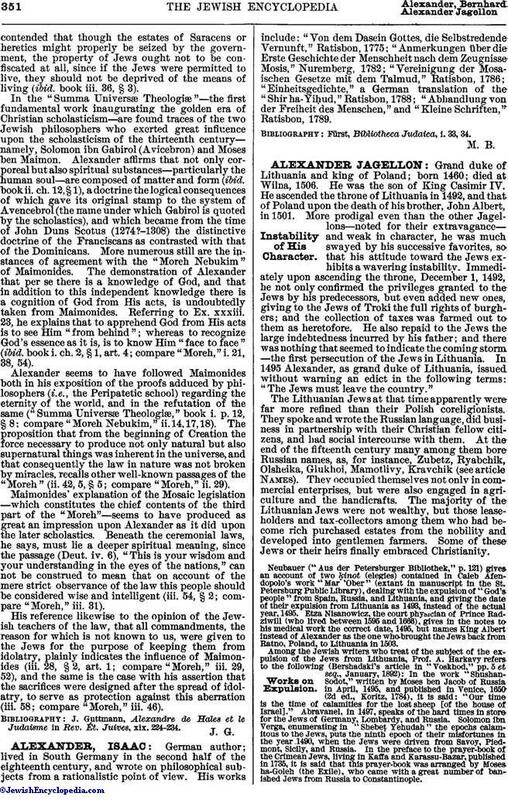 The demonstration of Alexander that per se there is a knowledge of God, and that in addition to this independent knowledge there is a cognition of God from His acts, is undoubtedly taken from Maimonides. Referring to Ex. xxxiii. 23, he explains that to apprehend God from His acts is to see Him "from behind"; whereas to recognize God's essence as it is, is to know Him "face to face" (ibid. book i. ch. 2, § 1, art. 4; compare "Moreh," i. 21, 38, 54). 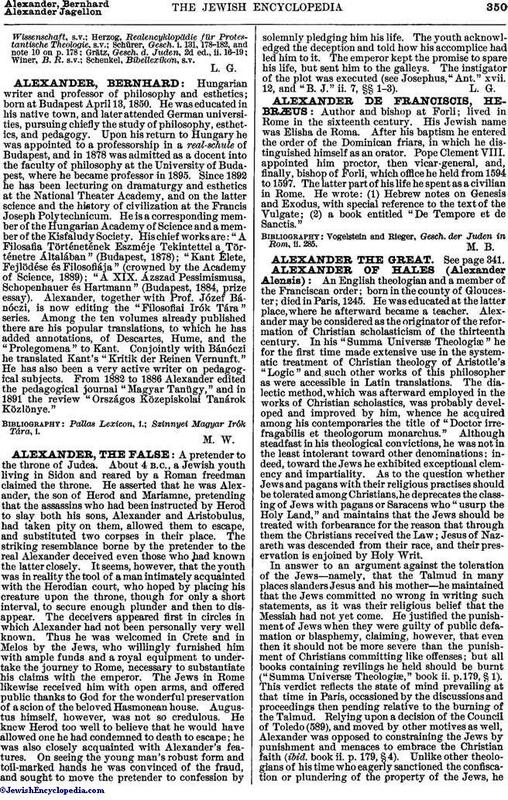 Alexander seems to have followed Maimonides both in his exposition of the proofs adduced by philosophers (i.e., the Peripatetic school) regarding the eternity of the world, and in the refutation of the same ("Summa Universæ Theologiæ," book i. p. 12, § 8; compare "Moreh Nebukim," ii. 14, 17, 18). The proposition that from the beginning of Creation the force necessary to produce not only natural but also supernatural things was inherent in the universe, and that consequently the law in nature was not broken by miracles, recalls other well-known passages of the "Moreh" (ii. 42, 5, § 5; compare "Moreh," ii. 29). Maimonides' explanation of the Mosaic legislation —which constitutes the chief contents of the third part of the "Moreh"—seems to have produced as great an impression upon Alexander as it did upon the later scholastics. Beneath the ceremonial laws, he says, must lie a deeper spiritual meaning, since the passage (Deut. iv. 6), "This is your wisdom and your understanding in the eyes of the nations," can not be construed to mean that on account of the mere strict observance of the law this people should be considered wise and intelligent (iii. 54, § 2; compare "Moreh," iii. 31). His reference likewise to the opinion of the Jewish teachers of the law, that all commandments, the reason for which is not known to us, were given to the Jews for the purpose of keeping them from idolatry, plainly indicates the influence of Maimonides (iii. 28, § 2, art. 1; compare "Moreh," iii. 29, 52), and the same is the case with his assertion that the sacrifices were designed after the spread of idolatry, to serve as protection against this aberration (iii. 58; compare "Moreh," iii. 46). J. Guttmann, Alexandre de Hales et le Judaisme in Rev. Ét. Juives, xix. 224-234.